No barbecue is complete without ribs. I was planning on making Pork Ribs with Coca Cola and Strawberry Jam, but didn't have any strawberry jam in my refrigerator. No problem, the Coke was the more important part of the recipe anyway. A little digging around my condiment shelf and a jar of fig jam seemed like the most likely substitute. I made a few modifications to the other recipe, adding in fish sauce and Sriracha for more savory and spicy notes. Can you believe all that was just one rack of ribs? I had the butcher cut it length-wise. I then cut each side in half, and used one quarter to make a soy sauce and spicy free version for the kids. 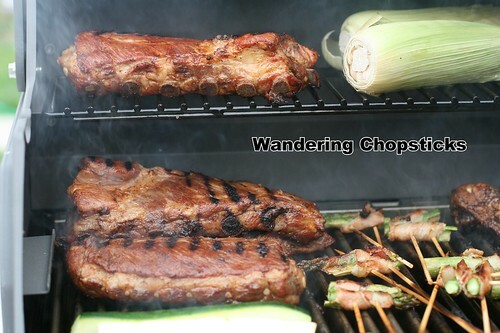 Again, I also cooked the ribs in the oven for half an hour to tenderize the meat and speed up grilling time. 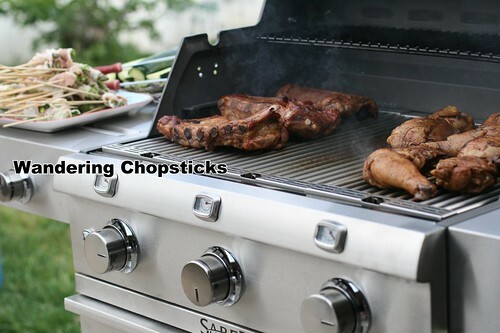 You can either cook these completely in the oven, which I've done plenty of times before, or cook them on the grill. Rub 1 tblsp of salt and 1 tsp ground black pepper all over the ribs. Set aside in a large shallow pan or bowl. Combine 1 tblsp fish sauce, 2 tblsp fig jam, 2 tblsp ketchup, 2 tblsp soy sauce, 1 tblsp kecap manis, 1 tblsp vinegar, 2 tblsp Sriracha, and 1 tblsp olive oil. Stir together until mixed thoroughly, and slather the paste all over the ribs. Then pour 1 12-oz can Coca Cola into the pan. 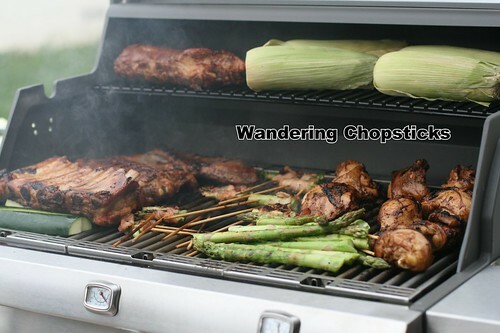 Refrigerate for an hour to allow the marinade to penetrate before grilling as desired. 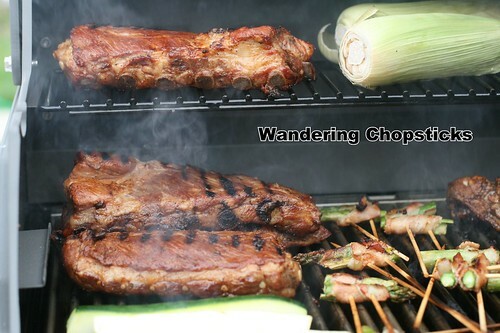 You can speed up grill time by cooking the ribs in the oven at 350 degrees for half an hour if you wish. Loving my new Saber Grill! 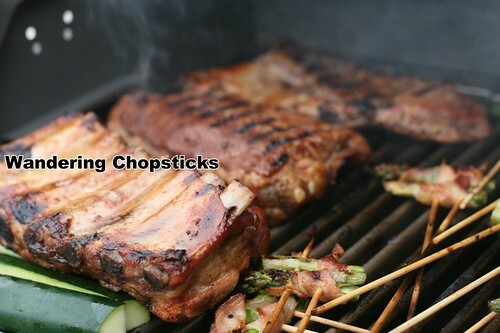 If you don't have a grill, you can also cook the ribs completely in the oven. Bake them meaty side-down at 325 degrees for 45 minutes. Then flip over and bake for another 20 minutes meat side-up. 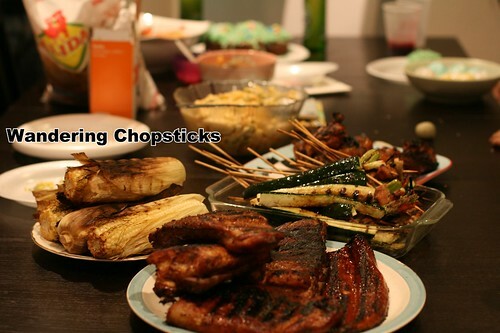 I, or rather my cousin and brother, also grilled some asparagus, zucchini, and corn. That's the Ga Nuong Me Cam (Vietnamese Grilled Tamarind Orange Chicken) you see on the right side of the grill. 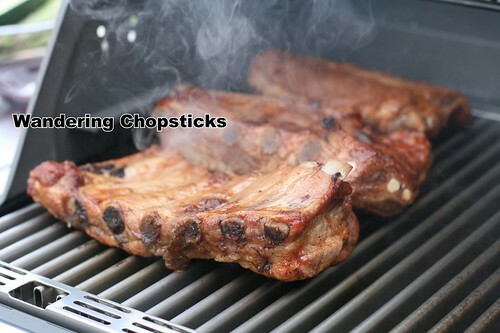 I love the smoky char of grilled ribs. Couldn't get that just cooking in the oven! This fed five adults and three kids with plenty of leftovers. 3 years ago today, Mike and Anne's Restaurant | Bar - South Pasadena. 4 years ago today, The Huntington Library, Art Collections, and Botanical Gardens (Chinese Garden) (Spring) - San Marino. 5 years ago today, a reader makes my ca ri ga (Vietnamese chicken curry). 6 years ago today, Wontons Stuffed with Ground Pork and Turkey, Bamboo Shoots, and Cabbage.